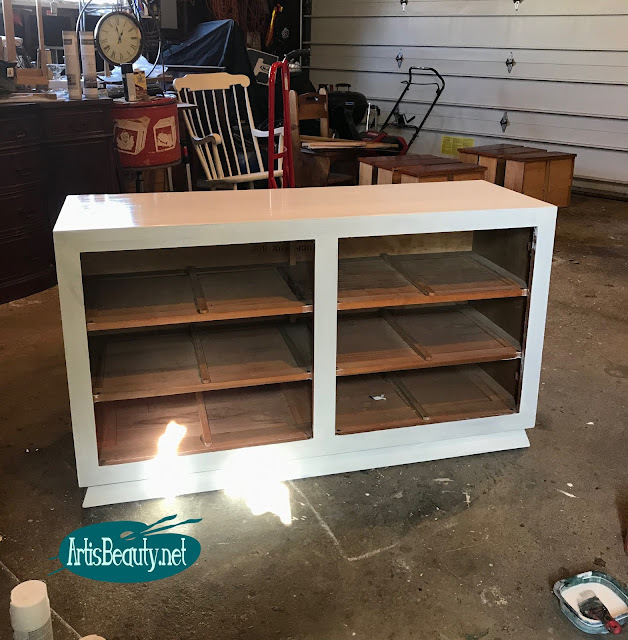 but I am in PROJECT mode before we leave for Spring Break and I had to bring some furniture into the booth, so I figured I would share one of the projects I had just finishes. I picked up this dresser at the thrift shop for a steal. 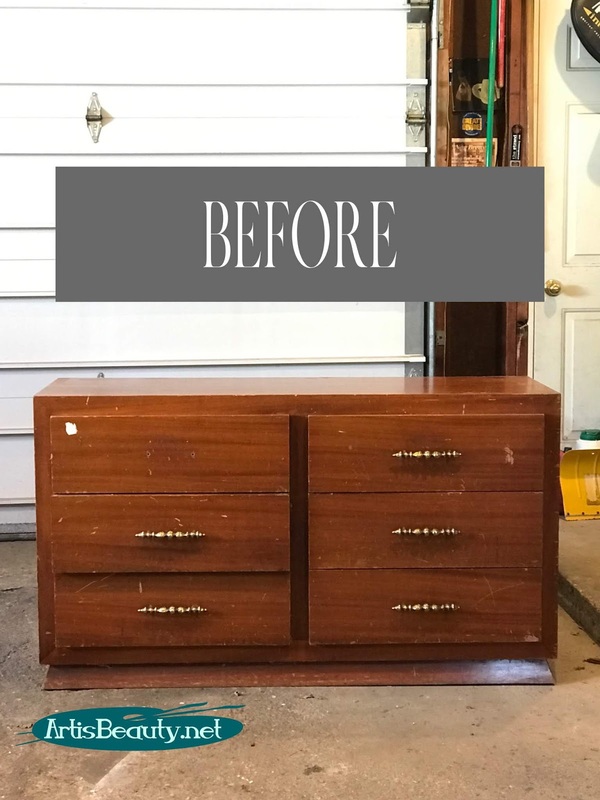 so I knew it just needed a little TLC to bring it back to a functioning piece of furniture. Lucky for me the base was the most beat up. 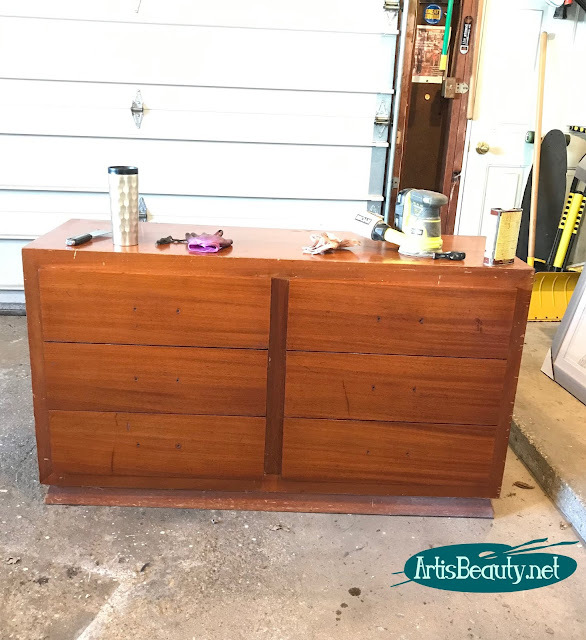 The drawers were actually pretty good and just needed to be cleaned up to bring back their pretty grain. Here you can see them all cleaned up. Since this thing was so solid I wanted to save what wood finish I could. The rest of the piece was so hacked up I knew that it would have to be sanded down. 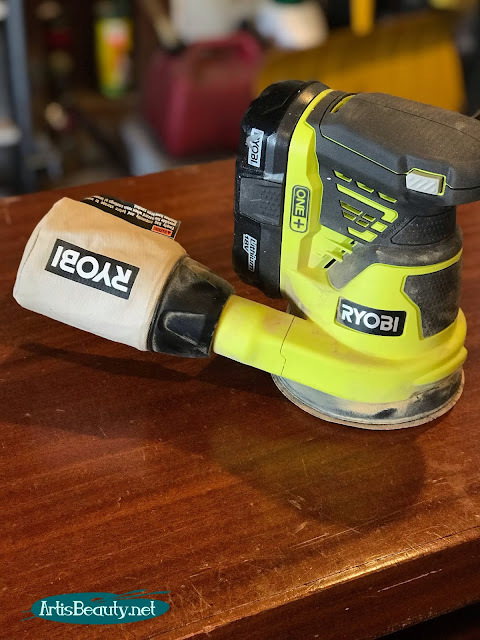 So I grabbed my favorite little tool, my Ryobi Cordless Sander and got to work. I tested a few colors next to the drawers before I started sanding and I went from there. 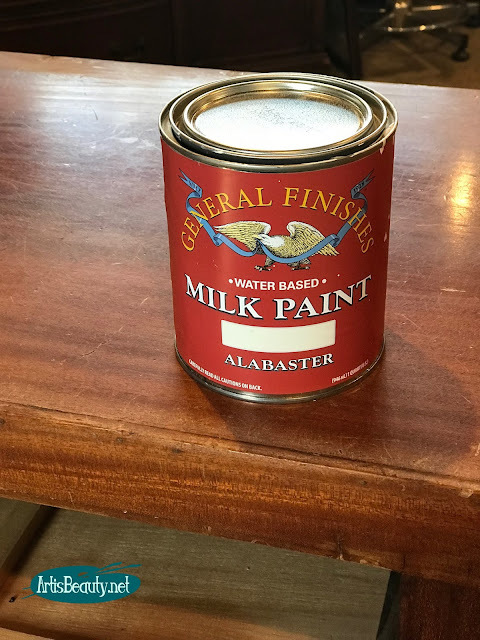 For the base I picked one of General Finishes new colors "Alabaster"
I don't tend to paint things white. I love color! 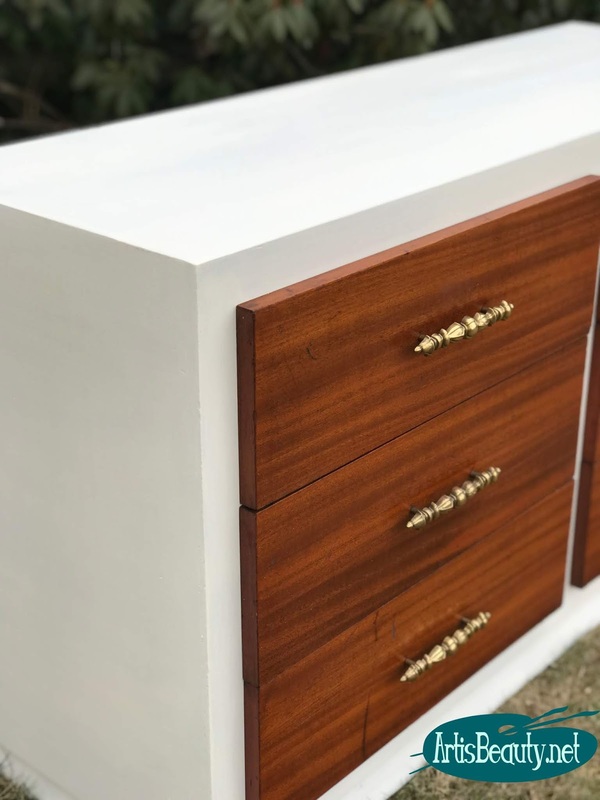 But this was like the perfect creamy white that played off perfectly with the hardware and the drawers. You can see here just after one coat, how much it changed the look of the base. No longer beat up, it looked fresh and clean! Here you can see it playing off the wood and the brass hardware. Since this is Michigan, I had to photograph the piece at my booth! At least I didn't have to freeze my fingers off to photograph it. So there you have it! One of about the million projects I have been working on. I hope you are enjoying some warm and spring like weather. We have to leave the state to get that, so we will be traveling a thousand miles to see the sun and warm! join me over on Instagram ! Just click HERE! to keep up with the behind the scenes! Your makeovers are always so inspiring. 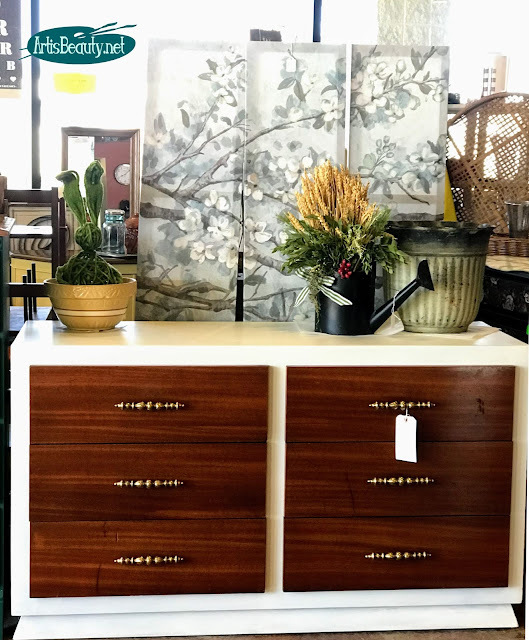 This one is a beauty, and I think it caught my attention because white isn't a first go-to for me either, but WOW! Does this ever make the grain of the wood pop in the drawers. Beautiful!! 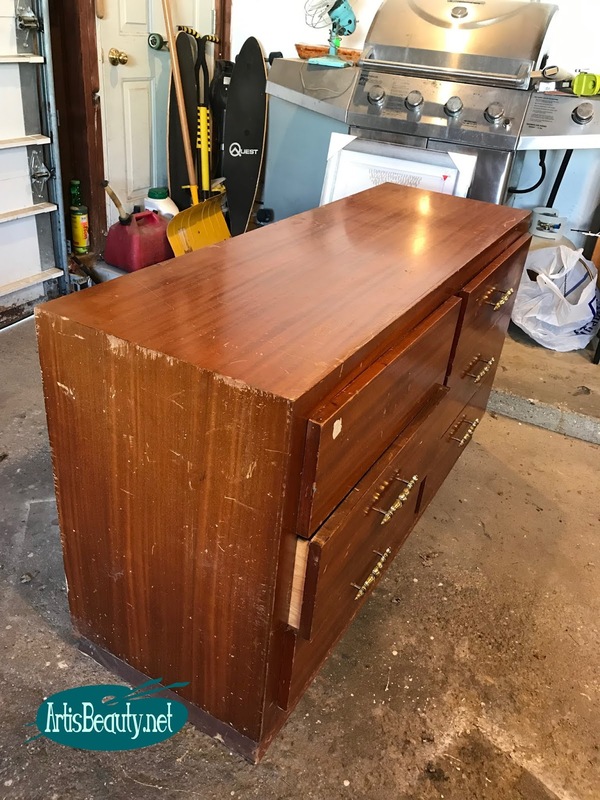 Was the missing drawer pull tucked inside the drawer when you bought the dresser, or did you have to source that one? Love what you did here!! @marieBlackburn That is too funny. 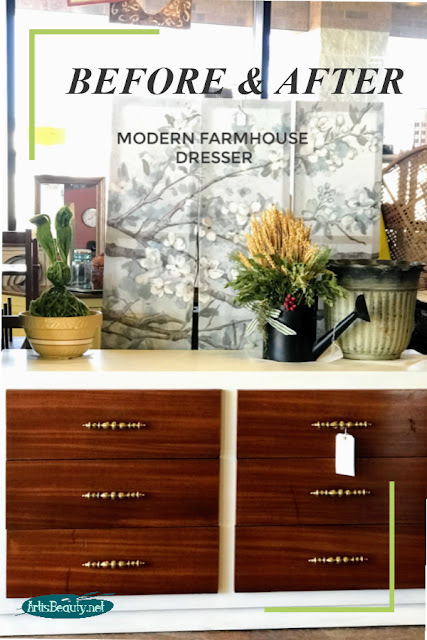 I have never seen a dresser like this before so I can't wait to see one almost like it!